The CF Toronto Eaton Centre seen on Mar. 1, 2018. Framework Venture Partners said Tuesday it has raised $100-million to date, securing $50-million from BDC Capital and $50- million from Cadillac Fairview, Royal Bank of Canada and the British Columbia government’s BC Tech Fund, managed by Toronto’s Kensington Capital. Framework, led by Toronto-based Peter Misek and Andrew Lugsdin in Vancouver, will also continue to manage $125-million worth of investments they made while they were partners with BDC Capital’s Information Technology Venture Fund. Those earlier investments include some of Canada’s top-performing tech startups including Wattpad Corp., TouchBistro Inc., Wave Financial Inc. and Elastic Path Software Inc.
Two entities affiliated with Fidelity Investments that had been in advanced talks to back Framework are not among the investors in the fund. Mr. Lugsdin declined to comment other than to say, “A fund is a partnership and we’re excited about the partners we’re with right now,” adding the fund expects to add other investors in the months ahead. Jose Ribau, executive vice-president of digital and innovation with Cadillac Fairview (CF), the commercial-property arm of Ontario Teachers’ Pension Plan, said the investment – its first in a Canadian venture fund – will come out of a new standalone organization seeded with tens of millions of dollars that will focus on bringing digital innovation to its portfolio of office, retail and mixed-use properties. “We see it as a critical way for us to help our retailers innovate and on the office side deliver services we know they expect from us,” Mr. Ribau said, adding he was drawn to the Framework partners' track record and their Canadian focus. “We’re not limiting ourselves to just being a passive investor, we’re going to be wrapping ourselves around the technology and figuring out how to deploy it,” including helping Canadian startups backed by Framework deploy their technology for pilot projects. CF is part of a wave of real estate firms looking to make their buildings “smarter” by using connected technologies and artificial intelligence to improve operations and serve tenants and consumers in new ways. CF recently piloted a program with ride-sharing app Lyft to help pinpoint pickup and drop-off locations for shoppers around the Toronto Eaton Centre based on what store they visited. CF follows Dream Unlimited and Dream Office REIT, related companies that teamed up last year with Toronto venture-capital firm Relay Ventures to invest in “property tech” firms through their Alate Partners joint venture. Brookfield Asset Management recently set aside US$200-million for property-tech investments by its Brookfield Ventures Unit while American venture-capital firm Fifth Wall Ventures raised its first property tech fund in 2017 backed by industry heavyweights including CBRE and Hines. Oxford Properties Group, the real estate arm of the Ontario Municipal Employees Retirement System, has also made several property-tech investments. 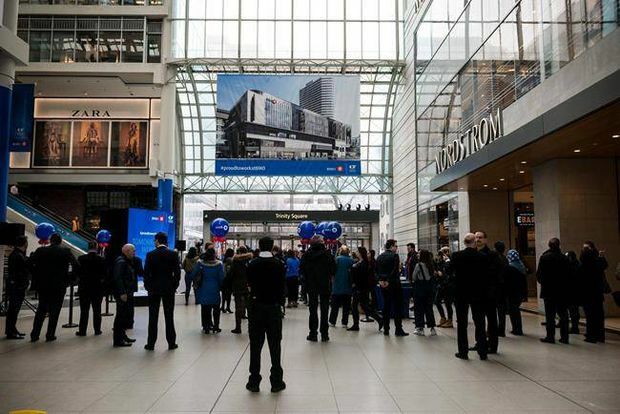 CF’s move is also notable as real estate companies have been among the few Canadian corporations outside of the financial sector and Telus Corp. to back the domestic venture-capital market. While its parent Teachers is an active technology investor globally with large stakes in foreign tech giants, it has largely stayed on the sidelines as Canada’s startup scene has blossomed this decade. The Framework spinout is part of a staged reorganization for BDC Capital, which played a critical role early this decade reviving Canada’s technology-funding ecosystem after institutional investors largely abandoned the asset class. BDC hopes to follow the Framework launch later this year with a similar spinout of its successful life-sciences fund. BDC will focus instead on areas that face funding challenges, including women-led technology firms. BDC Capital is also looking to create an in-house fund that will back firms bringing innovation to legacy industries such as manufacturing, resource extraction and agriculture. “We’re trying to move in early into some of those other sectors and hopefully our involvement … will bear fruit over the next five years,” BDC Capital executive vice-president Jerome Nycz said. For Mr. Misek and Mr. Lugsdin, Framework is a chance to build on their reputation as prescient, hands-on and supportive investors, according to CEOs they have backed. “Peter isn’t a VC who yells when things go wrong but who wants to dig in and help during those periods, which is a breath of fresh air,” Wave CEO Kirk Simpson said.